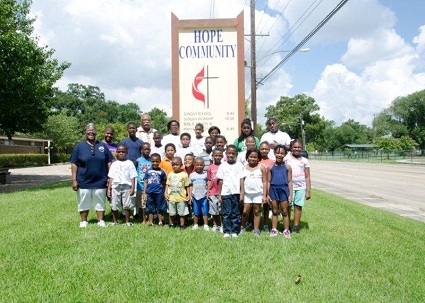 Hope Community United Methodist Church in Baton Rouge ministered to the mind, body and spirit of more than 37 children during its H.O.P.E Summer Camp this past June and July. Children ranging in ages from five to 15 participated daily in a morning devotional, Christian education, academics, arts and crafts, and physical activities. The camp was visited by the BREC “Mobile Playground” once a week and every two weeks by the local bookmobile. Campers were treated to movies, made kites from newspaper, crafted dolls from corn cobs and played jacks with Rev. H. Louis Jones, pastor of Hope Community UMC. Pastor Jones also brought his chicken, “Liz,” to the camp and unexpectedly, campers were able to witness his chicken laying an egg! Several field trips to BREC facilities and to the bowling alley were memorable parts of the camps. An excursion to Andrew Chapel UMC, pastored by Rev. Issaac Hammond, provided an exciting game of kickball at the area BREC Park. Rev. Hammond was a frequent volunteer at the camp. Camp H.O.P.E. was staffed by volunteers from Hope Community UMC and from the community. Each camp ran from 7 a.m.-4:30 p.m., Monday through Friday. Breakfast, lunch and a snack were provided daily. “With the grace of God and additional funding, we hope to increase the number of children we can accommodate next year,” said Rev. Jones.